Every yard, whether it is the crown jewel in the front, or the entertaining space in the back, deserves to be complemented by the best solar garden lights. Many homeowners only get to experience half of their lovely gardens due to inadequate lighting. That’s where solar garden lights come in: they add a touch of beauty and atmosphere to a yard while also providing an essential function. Whether you’re hosting dinner parties and BBQs on the patio or planning a whimsical garden-themed wedding, a well-designed solar light can add plenty of ambience. They’re even great for families who let their dogs out at night and want to keep an eye on them. Whatever your specific lighting needs are, solar lights are a better choice than traditional electric lights as they don’t require a wired connection, are very low-maintenance and environmentally-friendly. The High Points: A low per-unit cost combined with an elegant and modern design makes this a great garden light for first-time buyers. The Not-So: A low lumen count makes this light not very practical for large gardens or safety lighting. The Sunkllly outdoor candle lantern is our top pick for solar-powered garden lighting. 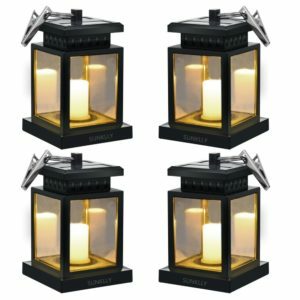 Its timeless glass box shape and unique LED candle make it a great choice for any homeowner looking to add a touch of elegance to their backyard. The benefit of garden lighting is that it doesn’t always need to be practical. While the lantern itself isn’t terribly bright, it still adds a great romantic glow to a patio or other entertaining area in an outdoor setting. Overall, the great 8-hour battery life and short charging time puts this lantern at the top of the list. It’s also very versatile in design and use, and you can place it under beach umbrellas, down the wedding aisle, or next to the grill. Its waterproof casing means you can even comfortably leave it in the “splash zone” of a pool. Most customers are very happy with the flickering effect of the candle light and the elegance of the casing. Many have simply placed their lanterns on the ground, patio or driveway to add a touch of light and beauty. However, some claim that one or more of the lights stopped working with no explanation after a few days or weeks of use. Since the lights come in packs of four, they still had others to rely on. This may be an inconvenience if you are planning an event or looking to decorate a large space. The lights are also smaller than they appear in the pictures online. This was disappointing to those who did not double-check the exact measurements. The small size may serve as a benefit for some and nuisance for others. The Sunklly lantern is both waterproof and heatproof, meaning it’s able to withstand a wide range of climates and environments. This is great for those living in areas that experience strong seasonal weather patterns. The lantern also comes with a durable clamp that you can use to hang the solar light in a tree, under an umbrella, on a patio or in a plant hanger. The solar panel situated on top of the lantern is also rather large, meaning it can still charge the lantern even when placed under a tree canopy (as long as some light is getting through). The lantern’s key design feature is a faux candle that shines with an ambient yellow glow. The manufacturer programmed the candle so that it flashes as though wind is blowing, creating a romantic atmosphere that simulates real candles without the safety concerns of open flames. With an automatic sensor, the solar lantern will automatically turn on at night and off during the day. The battery has the capacity to last all 8 hours when fully charged. Under direct sunlight, the lantern should only take 4 to 5 hours to charge. The High Points: A small swivel head allows for the spotlights to be discreetly placed in a garden for maximum impact. The Not-So: The detached solar panel requires wires to be used to connect the lights to their power source. With an incredibly bright light and extremely flexible installation, the Mini 50X is a perfect choice for any homeowner who’d like to add a touch of impact to their garden. The lights come in packs of 2 with a shared, detached solar panel. All of the elements are encased in aluminum and hard plastic and are very durable. These little lights certainly pack a punch. With their unique swivel heads and black coloring, the lights are able to be placed anywhere around the garden. They work great on home perimeters, such as lighting up the front façade of a house or the garden fence. 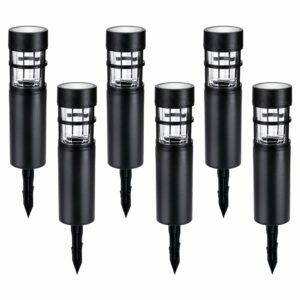 They can also be used to illuminate indoor-outdoor garden features, patios, large trees or bushes, swimming pools, driveways or pathways. Reviewers love how well-made the lights are. With an aluminum casing, they’re able to last years, saving buyers money on replacement lights. They are also easy to install on a variety of materials, like wood, grass, concrete and more. The intensity of the lighting is a key selling point for most purchasers. The lights are some of the brightest on the market for their shape and size, and the battery has a large enough capacity to sustain its high output. However, one reviewer wasn’t happy that the lights can’t be focused like other models can. They have a wide-spread light beam that illuminates a larger area, so it’s not suitable for those looking to brighten a very specific spot in a garden. One of the best and worst features of the Mini 50X solar spotlight is its detached solar panel. The fact that a large and cumbersome panel is not affixed to the body of a small spotlight means that the light can be placed in discreet positions. This is great for those looking to highlight architectural or landscaping features without drawing attention to the light fixture. You don’t need to physically place the lights in the sun for charging, unlike other spotlights. However, the detached solar panel requires wires to be used to connect the two spotlights to their power source. This is obviously not the most attractive choice and can be a pain for those looking to spread out their spotlights. Depending on your garden and use, this feature can make or break your purchasing decision. The lights are also very bright, with 80-120 lumens per light. Since they come as a duo, that means 160-240 lumens for the combined effect. This is plenty of light to illuminate the darkest corners of your garden perimeter with a dramatic and luxurious look. The light can even travel as far as 20 feet, making it an excellent choice for security purposes as well. Each spotlight has a swivel head that can cover a 45-degree angle area. Not only that, but you can stick the spotlight in the ground with an aluminum stake for “uplighting” or mount it on the wall with fasteners for “downlighting”. There are three different brightness settings which are easily adjustable. The metal and plastic casing is waterproof and can withstand most weather. However, if there is flooding, you will probably need to move your small lights. This is because they will not be able to manage being submerged for extended periods of time. The High Points: The unique vintage design creates a statement in any front or back garden. The Not-So: This light has the highest price point of any on our list, and only offers 1 light per pack. 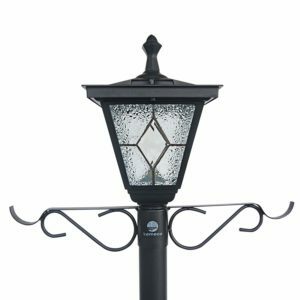 As one of the most unique solar lights on our list, the Kemeco lamp post is a great choice for homeowners looking for a classic and refined look. The Victorian-inspired street lamp is a modern take on a vintage design and offers a combination of practicality and decorative aesthetics. While the price point is arguably much higher than any other solar light on the list, the lamp makes up for it through its extra features, such as a surprisingly bright light, additional planters and hooks, and reasonable battery life. Reviewers are surprised at the amount of light emitted by the lamp as it only has three small LED lights. However, the lamp is quite bright and can illuminate a patio with no other lighting needed. Others discuss how easy it is to install and set up, considering its size. The lamp looks very charming and beautiful, especially with flowers placed strategically in the planter box and on the decorative hooks. Compared to other solar lights, this one stands tall above the crowd. At almost 6 feet high, the Kemeco lamp post is one of the largest. With a very unique vintage Victorian lamp post design, the solar light is a great garden feature of its own right. The lamp comes equipped with a planter base and two decorative planter hooks so you can decorate with flowers and bushes for a more natural and integrated feel. The head of the lamp is styled as a vintage glass box with three high-powered LEDs inside. These bright lights cast off plenty of ambient lighting, just like a real street lamp. The lamp is built from sturdy aluminum and Tiffany glass, while the planter is made of durable plastic. The casing is rust-resistant, and easy to maintain. On top of the lamp, and virtually out of sight, are four large solar panels for quick and efficient charging. With an auto sensor that turns the light on at dusk and off at sunrise, the lamp functions similarly to city-operated street lamps. This attractive and whimsical solar light is both practical and fun, and can utterly transform a garden, front porch or outdoor entertaining space. The High Points: The unique light design effect creates a soft ambience for pathways or driveways. The Not-So: Each light is not very bright which limits its practicality. 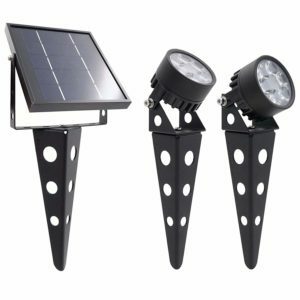 The AZIRIER solar lights are some of the best mid-level ground post garden lights on the market. With a very affordable price point and some unique design features, they offer a lot of value in a small package. The lights are in the shape of a glass tube that has a plastic roof and bars. The way the bars are on the glass creates an interesting pattern on the ground once lit. The dark plastic lights look almost nautical in their design as the glass casing resembles a light house. Many buyers love how easy to install the lights are, as well as the nice patterns of light that reflect on the ground. They report that the light is able to stay on all night with few issues, and that the lights look classy in small backyards. As like many other multi-pack solar lights, some reviewers have encountered defective units. They have reported that one or more out of the six lights flicker or don’t work properly, which ruins the effect in their garden. Each light comes with a built-in solar panel situated on top, so each unit is self-contained and super simple to install. There are no external wires or connections between units. This allows for maximum flexibility when deciding on placement and configuration. However, each light is only 2.4 lumens, meaning they are not very bright. Luckily, they come in packs of 6 and are designed to be used in a group. The combined output will be enough to brighten up a dim path or other perimeter area in the garden. The High Points: A beautiful and elegant design is balanced with durability and low maintenance. The Not-So: The battery does not have a very long life, and the lights are not terribly bright so it’s not the most practical choice. A brief scroll through social media will show you that string lights are all the rage in charming home design, both indoors and out. That’s why Brightech’s Ambience Pro LED outdoor string lights are one of our favorites on the list; they’re environmentally-friendly, stylish and affordable. The lights can be draped across a fence, patio cover, pergola or exterior wall for an added touch of ambience. The white lights create a soft atmosphere that’s perfect for dinner parties or entertaining. The overall effect echoes a café or chic hotel. They can even be used for special events, like weddings or photo shoots, and then reused later. While the battery life isn’t the longest, it does meet our minimum requirements. Luckily, the battery charges quickly in full sunlight, so the lights can be used every night. The large solar panel attached at the end of the string can also be tucked away on top of a fence for maximum sunlight exposure. Most reviewers love the Brightech Ambience Pro string lights and claim that the soft filament bulbs bring the right mood to their backyard. It’s a good price point and the lights are well-made, making it great value for money. The bulbs are made of plastic, so buyers don’t have to worry about breakage. The casing is also made of durable materials. Reviewers claim that the solar lights can withstand most environments without needing replacement parts like extra bulbs. Some reviewers were disappointed with the string length. According to the company, the lights are 24 feet long, but in reality, there’s only about 15 feet of light bulbs as the rest is wiring. This may be an issue for those looking to decorate a large space or requiring exact measurements. Another issue is that there’s no way to override the auto sensor. The lights will only turn on once it’s completely dark outside. If you’d like them to be lit during dusk for a dinner party, for example, you won’t be able to use them. This can be a problem for those looking for constant lighting or decorative features even when it’s not fully dark outside. The key selling point for the Brightech Ambience Pro solar lights is the string design. This fashionable look is great for a number of garden designs and adds a touch of charm and whimsy. Even better, the string lights come equipped with vintage-style Edison filament light bulbs, soft black casing and warm yellow glow. The string lights are 27 feet long, and have a solar panel attached at the end. The length is long enough to reach across a standard patio, but you may need to purchase multiple strings to meet your desired look. While most string lights, such as Christmas lighting, require extension cords and fancy maneuvering to get the plug to the nearest outlet, the Brightech lights are completely solar-powered so there’s no need to struggle. Just place the medium-sized solar panel in complete sunlight and wait for about 6 hours until it’s fully charged. The bulbs will stay lit for around 5 to 6 hours on a full battery. According to the company, the string lights can withstand wind of up to 50 miles per hour, as well as rain and damp climates. This is great for those living in more tropical environments. They also come equipped with an auto sensor that turns them on at sunset and off at sunrise. With an easy clip or stake installation, these string lights are very low-maintenance and can offer lovely garden ambience for up to 20,000 hours until they need to be replaced. The High Points: With a creative and whimsical flower shape, these lights can add zest to an otherwise dull garden. The Not-So: The faux flowers are not practical lights and serve a more decorative function. The TONULAX lights are so different and creative that you’ll swear they aren’t solar-powered lights. Each light is styled as a faux lily flower and is equipped with color-changing LEDs for an extra dose of fun. They can be “planted” in the ground using stakes or nestled into any garden bed, pathway or other lackluster area of the yard. While the lights aren’t exactly practical lighting solutions for a dark yard or balcony, they do offer something unique that the whole family will love. There are many different brands of faux flower lights on the market, but the TONULAX models stand out for their high quality and affordable price point. Most buyers prefer the TONULAX brand over others as they are more durable, have better solar panels, have bigger flowers and you can style them with a wire frame. Many have “planted” them in their backyards among their real flowers and love the effect. The solar panel is of a high quality and can charge the battery even during cloudy conditions. However, some buyers wish there was more variety in design so they could purchase multiple styles of flowers for a different look. The TONULAX solar lights mimic the beauty of lily flowers. With a colorful and creative shape, the lights offer a touch of whimsy to a garden bed or flower pot. Their solar panels are small and hidden away on the “stem” of the plant, so they are not visually distracting or obvious. Each solar lily has LEDs that can change to 7 different colors. They also have flexible stems and leaves that you can bend to create a more realistic shape. Also, the artificial flowers consist of waterproof glass and other materials that can withstand inclement weather. With two flower lights per pack, you can go wild with decoration and dress your garden in a sea of beautiful lilies with various colors. What will you be using the lights for? How often will you be using the lights? Is your garden sheltered from the elements? What type of garden features do you have? Every homeowner is looking for something different when it comes to solar lighting. Some may have landscaping features they’d like to complement, while some may be looking to spruce up a tired patio. Each use comes with its own set of needs in terms of design and functionality. That’s why it’s important to consider a few variables before settling on a specific type of light. There are a few different uses for garden lights, from security to decoration. But most first-time buyers are looking for a mixture of practicality and beauty, or something to stick in the garden that’s easy to maintain and pleasing to the eye. Luckily, there are plenty of options available so your decision will ultimately come down to aesthetics. Do you like faux finishes that emulate flowers, logs, tiki torches or rocks? Are you a modern design lover and looking for something simple, edgy and clean? Or are you interested in a low-profile look to line a garden path? For those who are looking to highlight a garden feature, spotlights are perfect. String lights and hanging lanterns are wonderful for patios and summer dinner parties. Small pathway lights or wall-mounted lights are great for front gardens, elderly homes, and warding off intruders. Torches and creative décor are wonderful additions in gardens where the purpose is to entertain. Once you’ve determined your specific use, it’s important to look at the space you’re going to place your lights in. For those who need practical lighting more than ambience, a bright solar light is imperative. Lumens are the measure of brightness, so any light above 15 lumens is more practical and less decorative. If you have a large garden area, you’ll need a bright light that’s able to illuminate the entire space. Some solar lanterns become dimmer as the night goes on and their battery expends its energy, so you’ll need to factor that into your estimate. A light that’s able to reach the far corners of your yard at 8 p.m. may not have the same effect at 2 a.m., for example. However, you should group some lights together, like pathway lights. In this case, the individual lumen rating is not as important. Rather, the combined output of your planned number of lights should be the determining factor. Some lights are sold in packs of 2 or more. You may need to purchase multiple packs to cover your desired circumference, so pay attention to the pack count if you’re looking to save money. Some homeowners may only be using their lights for temporary special events, like weddings or dinner parties. In that case, lights that have beautiful designs, but may not be made of strong materials, would be appropriate. Manufacturers did not build these lights to withstand strong weather and you can use them intermittently throughout the year for decorative purposes. You’ll also be able to use cheaper lights that don’t have a good warranty because it’s unlikely you’ll need to replace them. For those with an interest in long-term lights, you’ll need to keep an eye out for models that are durable glass, metal or thick plastic. These are more likely to withstand inclement weather, sun-aging and other hazards like pets, accidental kicking or tripping and water splashes from pools or watering the garden. They may also come with warranty policies, replaceable parts and customer guarantees. These extra features all offer a sense of security for homeowners who are investing in multiple solar lights at once. Your local weather patterns are an essential consideration for purchasing solar lights. This type of solar lighting is specifically for use outdoors and not under cover. So these lights will be exposed to the elements. Heavy rain, extreme heat or cold, frost, snow and storms may damage the lights. Manufacturers build most high-quality solar lights with this in mind and offer features like waterproof or water-resistant casings, external solar panels that can withstand high temperatures and durable designs. However, your lights may not be entirely protected if they are frequently exposed to flooding or dense blankets of snow. In this case, it’s important that you purchase a model that is easy to install and move so you can place them in storage during storms or the winter months. You should also take note of any big trees in your garden. Some lanterns can still charge in light shade, and the extra protection of a top cover can help to keep your sensitive solar panels working for years on end. Those with beautiful landscaping elements like tall palms, fountains, or seating areas should look at lights with adjustable heads. These small and easily hidden solar lights can make any home look luxurious with a showcase home feel. On the other hand, large patios or pergolas look beautiful with string lights, warm lanterns and other ambient lighting. You can either place them on the ground, hang them on hooks, drape them across wooden beams or install them overhead for an outdoor-indoor look. There are a lot of creative options available on the market. For those with very tall trees, hanging lights look wonderful. They can add a touch of magic to any backyard and are special favorites for families with kids. Hanging box lights also look great under pool-side umbrellas. On the other hand, ground post lights are essential for brightening up a dim path or driveway. They are also used to line the perimeter of swimming pools or ponds, serving both a practical and decorative use. 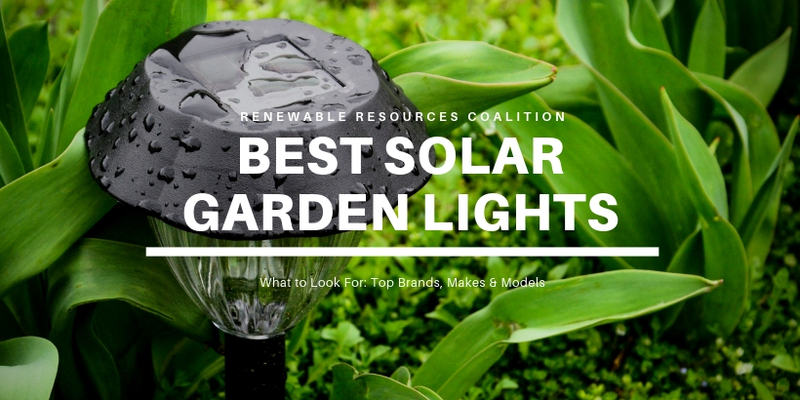 Based on a set of criteria, we’ve narrowed down the huge list of options to the best 6 solar garden lights. Our rankings place a special emphasis on versatility, and appreciate unique designs that can add elegance, charm or atmosphere to a garden. Most solar-powered batteries will last 5-8 hours on a full charge. This is generally enough time to light up a garden area all night long, or at least during the darkest hours. Some take longer to charge fully in the sun, and this will affect the overall efficacy of your light depending on your location. For example, if you live in an area where there are only 4 hours of sunlight a day, then your light will not be able to stay lit all night long because its battery will only be performing at half volume. Seasonal variation will also affect the battery life. However, according to our metrics, a light that has a capacity of 6 hours or more has a good battery life. And if it’s able to last more than 8 hours, that’s even better. There are a variety of different shapes of solar lights available on the market, and one size does not fit all. Depending on your use and placement, the shape and design of the solar light is important. Generally, small- to medium-sized lights are better as they offer the most flexibility of placement. Also, practically built lights that offer protection for their sensitive solar panels and are easy to install are more attractive than other models. This includes lights that have stake posts, hanging clips or hoops, or flat bottoms for ground placement. The lumen rating of a solar light refers to its level of brightness; the more lumens, the brighter the light will be. While not everyone wants or needs incredibly bright lights, there is still a minimum threshold of brightness as the light needs to be functional. Generally speaking, a lumen count of 2.5 or above is acceptable for ambient lighting. For safety purposes, a lumen count of 50 or above is expected. Some solar light manufacturers don’t list the lumen rating of their lights, and only include the wattage. It’s very easy to convert watts to lumens but be aware that the lumen output for incandescent bulbs is lower than that of LED bulbs. Most solar-powered lights use LEDs. Most small solar lights, like pathway lights and decorative accents, come in multi-packs. This is very useful for homeowners who are looking to light a large garden because it reduces the total cost. Most packs come with 2 lights, but some offer 6 or more lights per box. For unique decorative accents, like string lights or Victorian lamp posts, you’ll probably not need more than 1 unit. Companies generally sell these types of solar lights in single packs. Each homeowner has their own use in mind for their solar lighting, which includes placement, layout and need for brightness. Most important, however, is versatility. A solar light that can meet a variety of needs is better if you can move it and reuse it in different areas of the garden depending on the weather, event or evolving taste and style. Most garden lights are solely for the purpose of being decorative, but some serve as functional and practical light features. A solar light that can do both is highly desirable and is a worthy investment for any garden. Generally speaking, you can place solar lights along an outdoor perimeter, in a tree, in the grass, on a patio, next to the pool or around an entertaining space. Can I keep the lights outside all year round? Will I need to run ugly wires to my lights? Can you buy replacement parts for the lights if they break? How long does it take to charge a solar battery? Most, if not all, solar lights come with weather protection, such as waterproofing, heat-proofing, the ability to withstand wind and durable casing. However, not all solar lights are as capable as others. The solar panels that power a solar light are extremely sensitive. Any damage that frost, water or extreme heat causes will render the whole light useless as it won’t be able to charge. If you live in an area that has frequent extreme weather patterns, like high humidity, heavy snow or rain, flooding or storms, then it’s best to plan to store your solar lights inside until the sun returns. This may mean you’re unable to use the lights during winter months. In this case, you can purchase a model that’s very easy to install, such as self-contained stake lights or ones with clips, as they can be quickly removed or returned to their outdoor location depending on the weather. One of the biggest benefits of using a solar-powered light, minus the environmental aspect, is that they are generally wire-free. There’s no need to run an ugly extension cord from a hard-to-reach outdoor power outlet. However, there are some models, such as the Mini 50X spotlight, that do use wire connections to link the solar panel to the light fixtures. These are not very common and are relatively discreet considering they only need to reach the light and panel, rather than a power plug. Depending on the company and brand, you might be able to purchase replacement parts for your light. Some may even come with a warranty. However, most do not offer such parts, so your light is effectively useless once one of its essential components breaks, like the battery or solar panel. The more you spend on a solar light, the more likely the brand can accommodate such requests. Most solar lights online are relatively cheap and don’t have quality guarantees. If you have concerns about accidental breakage, then it’s worth it to buy a more expensive, higher-quality model that has a warranty or backup components for purchase. Most solar garden lights are small, so their solar panels are a similar size. However, when you place them under direct sunlight, you can fully charge a solar battery in as little as 4 hours. The weather conditions need to be ideal and make sure that nothing is shading the panel, such as trees or patio furniture. Some solar lights take much longer to charge, especially if you place them in non-ideal locations that don’t get much sun. These lights may take up to a day to charge completely. 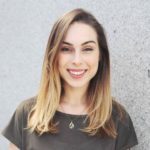 Mariah Grimwood has been producing web content for two years and counting, with an extra special focus on things she's passionate about: eco-friendly options, travel and education. With her knack for research and eye for unsightly syntax, she's on a mission to revitalize informational resources for online readers.